An artist's concept of the Deep Space Climate Observatory (DSCOVR) satellite, a space observatory made from recycled components of the Triana Earth-observation satellite. A mothballed satellite that languished in storage for years is now on track to launch in early 2015. The Deep Space Climate Observatory, or DSCOVR for short, passed a key review that determined the mission is on target to meet its cost and schedule requirements, according to a statement from the National Oceanic and Atmospheric Administration (NOAA) on Tuesday (Sept. 10). 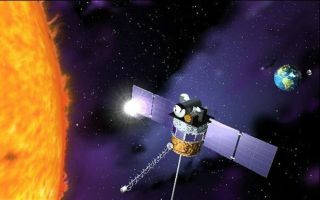 The satellite is designed to detect potentially Earth-threating space weather that could cripple electrical grids, hobble communications systems and disrupt air travel, satellites and spaceflight. The DSCOVR satellite will orbit at the sun-Earth Lagrange point 1 (L1), a stable region about 900,000 miles (1.5 million kilometers) away from our planet where gravitational forces are in equilibrium. From this faraway parking spot, the satellite will pinpoint solar storms before their effects reach the Earth. DSCOVR's secondary mission is to look back at Earth from the L1 point, with sensors that can measure ozone levels, cloud cover, vegetation changes, surface radiation and atmospheric pollution, among other factors that impact the health of the planet. The mission has been in the works for over a decade. Originally called Triana, the refrigerator-sized satellite was first approved in October 1998 and intended to launch aboard a space shuttle, but as the mission's costs rose, it became entangled in political battles. Opponents of the project in Congress characterized the satellite as an overpriced "screen saver," seizing upon former Vice President Al Gore's vision that the mission would produce live imagery of the sunlit side of Earth 24 hours a day. A few years ago, the satellite was taken out of storage in Maryland and refurbished by NASA. The mission represents is a partnership by the NOAA, NASA and the U.S. Air Force. The spacecraft will be launched aboard a Falcon 9 rocket built by the private company SpaceX.